The 2014 World Cup tournament will begin on June 12th in Brazil. 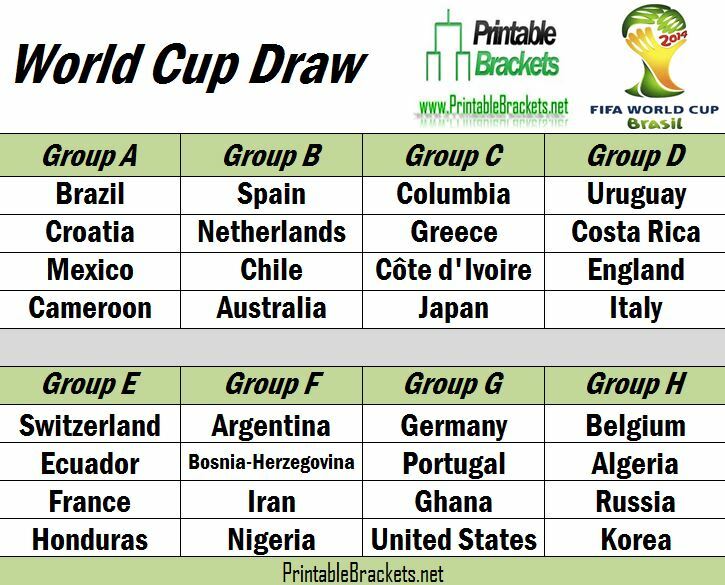 The World Cup draw features some very interesting groupings for the 20th installment of the international football tournament. The World Cup event will run until a champion is crowned on July 13th. Spain enters the 2014 World Cup draw as the defending champion after notching a 1-0 victory over the Netherlands in the 2010 final. Brazil will serve as the host for the 2014 World Cup tournament. Brazil will become the fifth country to host the World Cup draw on two occasions, but the tournament is returning to South America for the first time since 1978. Brazil has also had the most overall success in the World Cup tournament. The Brazilians have won the event a record high five times. In addition, Brazil has finished as runner-up twice and placed third on two other occasions. The only country that has qualified for every World Cup draw is Brazil. A total of 12 different cities in Brazil will host World Cup matches, including Rio de Janeiro, Brasilia, Salvador, Fortaleza, Natal and Curitiba. Nearly four-billion dollars has been spent on building stadiums to host World Cup draw matches.